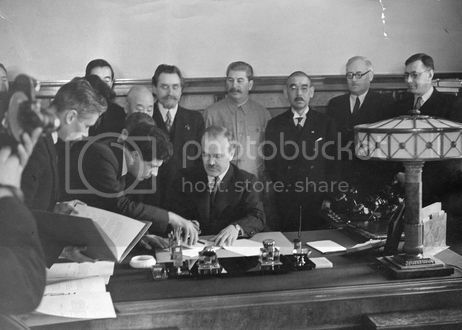 The Soviet-Japanese pact came nearly two years after the Soviet Union signed a similar agreement with Nazi Germany, dividing much of Eastern Europe between the two countries. The Molotov-Ribbentrop Nonaggression Pact allowed Nazi leader Adolf Hitler to move German forces to the West for his major offensives of 1939 to 1941 and bought Soviet leader Joseph Stalin time to prepare the empire for what he saw as its inevitable involvement in World War II. During the Yalta conference in early 1945, Joseph Stalin, at the urging of U.S. President Franklin D. Roosevelt, agreed to declare war against Japan within three months of Germany’s defeat. On August 8, 1945, true to Stalin’s promise, the Soviet Union declared war against Japan, and the next day the Red Army invaded Manchuria. The same day, the United States dropped its second atomic bomb on Japan, devastating Nagasaki as it had Hiroshima three days earlier. Faced with the choice of destruction or surrender, Japan chose the latter. This entry was posted in Uncategorized and tagged 13 April, 1941, Pact of neutrality by admin. Bookmark the permalink.